Jacob Merritt Anthony’s wedding, unlike his brother’s, was anything but traditional. 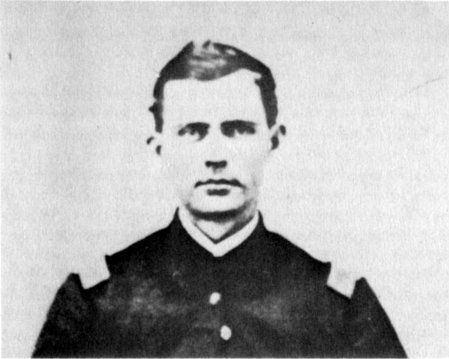 In the winter of 1858, at the height of the Border War between Kansas and Missouri, he met his bride at the depot and whisked her off to the preacher during the night. And if that wasn’t enough, he chose a cabin hung with hog carcasses for their honeymoon! Reverend Samuel Adair and his family remained in their nightclothes during the actual wedding. Presumably they were well-acquainted with young Merritt, who fought with Brown at the battle of Osawatomie in 1856, almost on the minister’s doorstep. One of the first casualties of that battle was the Adairs’ nephew Frederick Brown, who was shot to death in their yard as their little daughter sat looking out the window. This must have been especially hard for the minister and his wife, who were pacifists. Merritt married Mary Almina Luther from back East, who is always referred to as his cousin. It’s easy to imagine them knowing each other from childhood and having a relationship easy enough to share a wedding night with hog carcasses–presumably to safeguard the meat from wild animals. 1, Letter by Luther B. Anthony to his daughter Susan, dated October 24, 1954. From the collection of Dr. Susan B. Anthony, University of Rochester Special Collections. (Note: neither of these Susans referred to the famous reformer. Remember–they liked to recycle names.) Contributed by Phyllis Stehm, genealogist. This entry was posted in Merritt Anthony and tagged Florella Adair, Frederick Brown, Jacob Merritt Anthony, John Brown, Mary Luther, Osawatomie, Samuel Adair, wedding by Jeanne. Bookmark the permalink.